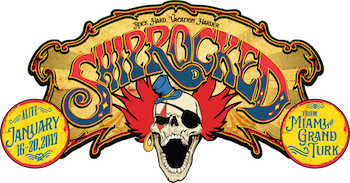 "THE GREATEST VACATION ON EARTH"
Despite selling out in just one week after staterooms went on sale to the public in May, ShipRocked 2017 continues to add to its stellar lineup. ShipRocked veterans Art of Dying, Stitched Up Heart and Letters From The Fire, as well as first-timers Living Sacrifice and Them Guns, join a lineup that features headliner Breaking Benjamin, along with Papa Roach, Alter Bridge, Sevendust, Pop Evil and more. ShipRocked 2017 sails January 16-20, 2017 from Miami, FL to Grand Turk in the Turks & Caicos Islands onboard Carnival Victory. 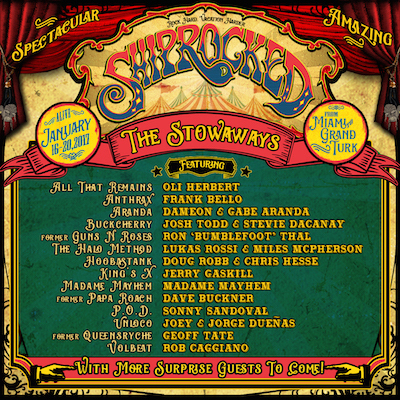 In addition, ShipRocked's own all-star band The Stowaways and its revolving cast of special guests will once again be pulling out all the stops with classic hits, unexpected surprises, and a roster of performers that can't be seen anywhere else. The initial roster for the 2017 edition of The Stowaways has been revealed, including Oli Herbert (All That Remains), Frank Bello (Anthrax), Dameon & Gabe Aranda (Aranda), Josh Todd and Stevie Dacanay (Buckcherry), Ron "Bumblefoot" Thal (ex-Guns N' Roses), Doug Robb and Chris Hesse (Hoobastank), Jerry Gaskill (King's X), Madame Mayhem, Dave Buckner (ex-Papa Roach), Sonny Sandoval (P.O.D. ), Geoff Tate (ex-Queensrÿche), Lukas Rossi and Miles McPherson (The Halo Method), Joey & Jorge Dueñas (Unloco), and Rob Caggiano (Volbeat). Those who would like to make a reservation for ShipRocked 2017 can join the waiting list by visiting www.ShipRocked.com. 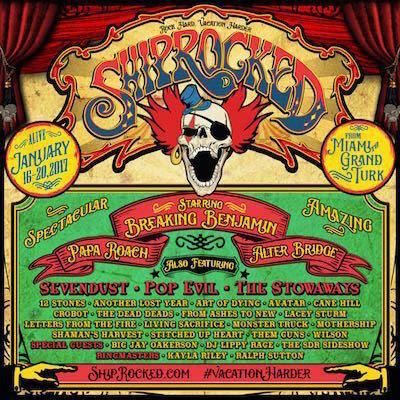 The full lineup for ShipRocked 2017 is as follows: Breaking Benjamin, Papa Roach, Alter Bridge, Sevendust, Pop Evil, The Stowaways, 12 Stones, Another Lost Year, Art of Dying, Avatar, Cane Hill, Crobot, The Dead Deads, From Ashes To New, Lacey Sturm, Letters From The Fire, Living Sacrifice, Monster Truck, Mothership, Shaman's Harvest, Stitched Up Heart, Them Guns, and Wilson, plus the comedy of Big Jay Oakerson; D.J. Lippy Rage; The S.D.R. Sideshow; with ringmasters Kayla Riley of SiriusXM's Octane and Ralph Sutton of The Tour Bus Radio.